Welcome to the 18e Régiment d'Infanterie de Ligne (18e RIL). We are a group of like-minded living history practitioners striving to achieve the look, feel, and attitude of the typical French soldier (or Poilu) of the Great War, 1914-1918. ​Our mission is to honor the brave men who served in this conflict and paid the ultimate sacrifice to protect their families, land, and country. We honor their memory by striving to "do it right", using well-researched and historically correct uniforms, equipment, and mannerisms. We do not glorify or attempt to justify the tragedy of the First World War. We merely try to understand it through the eyes of the common French soldier who fought it. 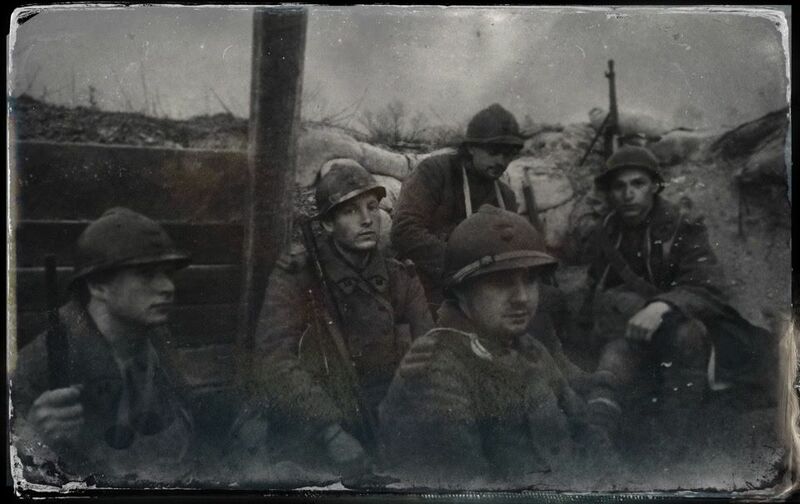 Men of the recreated 18e rest in the trenches of the Newville Sector. ​​The 18e ​RIL was founded in 2005 and has since been a proud member of both the Bataillon Français and the Great War Association (GWA). The unit is based in the Mid-Atlantic U.S., but we have members throughout the country. Our primary focus as a unit are the semi-annual tacticals held at the GWA site in Newville, PA. However, we are also working with other units to organize and promote additional events, including 36-hour 'immersion' events that are intended to mark the Centennial of the Great War and provide our members a better opportunity to experience and understand the daily routines of the men who took part in it. Members of the 18e ​RIL also participate in various Living History events, through which we aim to educate the public about the Great War and the tremendous efforts of the French Poilu in the conflict. This website is a 'work-in-progress', and will remain so as we add more photos, information, and research. In addition to providing information about our Living History group, it is our intention that this website become a public resource for information on the historical 18e Régiment d'Infanterie de Ligne. For more information, or to inquire about our group and our research, please contact us through this website or through our Facebook group.